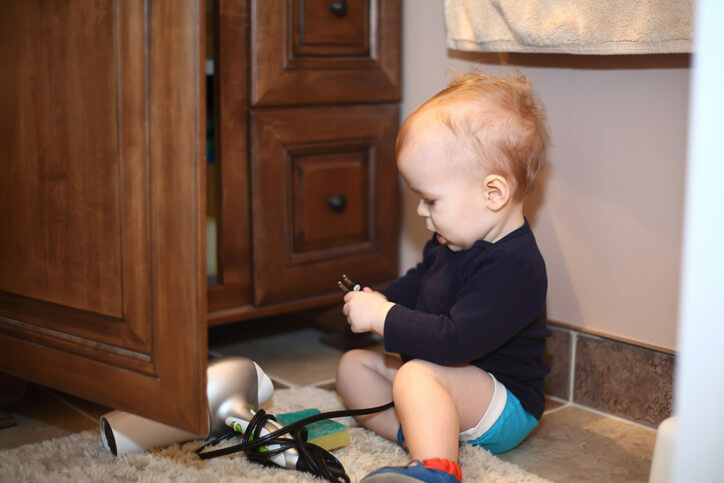 When your child is able to walk around from room to room in your home, you start realizing the child proofing you did back when they were an newborn or infant needs some updating. And fast. Whether your home has one bathroom or more, the bathroom is one room in the house that needs to be thoroughly childproofed. Cover the tub faucet with a rubber or plastic cover to prevent injury while in the tub. Many companies make the covers in fun characters and shapes. Install a toilet seat lock so little hands don't get hurt lifting and closing the lid while they are trying to use the toilet during potty time. Only use nonslip rugs or mats in the walk areas of the bathroom. This will prevent slips and falls while in there. Keep all medication and vitamins on the top shelf of the medicine cabinet. Even if they have childproof lids, its better to be safe. Place outlet covers in all outlets. And when you are done using an outlet remember to place the outlet cover back in the outlet. Put a lock on the under the sink cabinet so cleaning supplies can be kept away from children. Buy a scald protector or temperature gauge to reduce the chance of serious burns.